Cane furniture seems to be trending these days and we are finding more and more places for you to shop at. 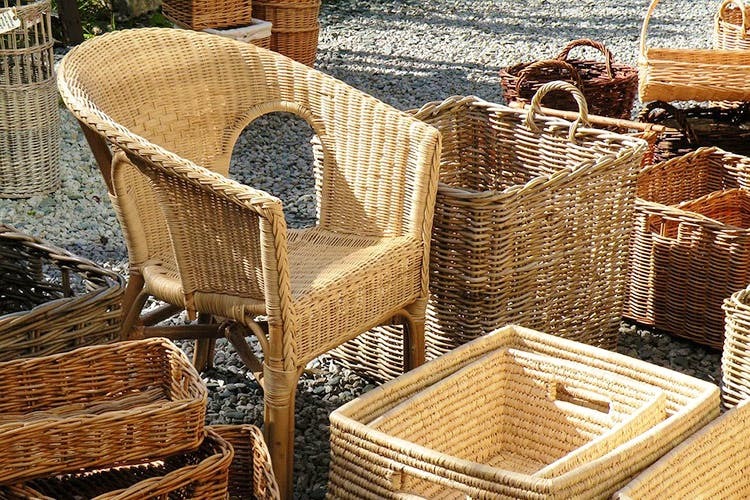 Vishal Cane Furniture in Jayanagar is one such place for doing up your house with cane furniture on a budget. Vishal Cane Furniture shop is just like every other cane shop albeit this one has all the cane furniture pieces neatly arranged like it’s on display at Home Centre. Amongst the cane swings, the armchairs, and sofa sets, finding something is a bit hard but luckily enough the guys who are there will help you out. Say you don’t want a three-seater sofa for your place, they will hook you up with other designs as well. And if custom designs are what you are looking for, these guys will be more than happy to help you out. Like we mentioned before, the furniture shop stocks up on all kind of furniture starting from sofa set to single armchairs and bookshelves to stools. Coffee tables, teapoys, and baskets that could use for anything from keeping books to laundry are other items you find here. The rates for bespoke furniture depends on the design and how much man-hours is spent on it, so the rates could start anywhere from INR 3,000 and above. The sofa sets start from as low as INR 8,000, while armchairs start from INR 850 and above. Bookshelves are priced according to the design and the lowest we found was at INR 1,500.